The emergence of the unusual 'face' of the new Nissan Micra will have nondescript look-alike rivals scurrying to the design studio for a make-over. The Micra’s bold new look is unmistakable. A high-rise roofline, short front and rear overhangs, elevated driving position and airy cabin set it apart from the other hatchbacks. High-mounted circular headlamps perch atop the bonnet, instinctively induce a warm welcoming smile from all who encounter this city-centric five-door. The beauty is more than skin deep, however. Zipping through town couldn’t be easier with a standard slick-shifting four-speed automatic taking the stress out of stop-start driving. The only gear drivers need to worry about is what they’ll be wearing to the office Christmas party. Micra’s fashionable array of paint colour choices kills the rush-hour blues, with an urbane city-themed pallet, from Roma Red to Tokyo Silver and London Rose. Trips to the service station will be few and far between thanks to Nissan’s latest generation four-cylinder aluminium 1.4-litre engine. Its punchy 72 kW output gets the feather-weight Micra off the mark in a flash, and cruising the streets in search of a park won’t drain the tank. 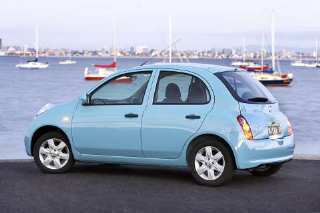 Micra returns around 6.8 litres per 100 kms. Speed sensitive electric power steering gives maximum assistance at parking speeds, when the tight 8.8 m turning circle is put to good use. At higher speeds, the level of assistance declines in favour of increased feel. The result is a highly responsive car that is nippy in city driving and secure when cruising our great open roads. In addition to looking cool, Micra drivers will stay cool even in the height of an Australian summer thanks to standard air conditioning. The all-round power windows slip open speedily to let the hot air out after a morning parked in the sun. With an adorable starting price of just $14,990* Micra buyers will have plenty of cash left over for shopping centre forays and plenty of space in the boot for their boutique bargains, too, with 251–litres of luggage space with the 60/40 split-fold three-place rear bench in place. When Micra owners really go to town, there’s 584-litres of luggage space when the rear seats are folded forward. Keyless entry and central locking add to the pleasure of convenience when loaded with parcels, while power adjustable mirrors and an MP3 compatible single in-dash CD player are also standard. 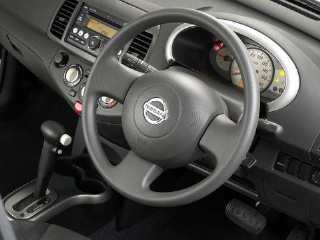 There’s also an auxiliary MP3 input jack for easy access to Micra owners’ preferred play lists. Personal safety, too, is never far from any city dweller’s mind, but the Micra driver has little to worry about. Standard equipment includes anti-lock brakes with electronic brake force distribution and brake assist, active front head restraints and dual airbags. The $1,700 Micra City Collection option package adds dual side airbags and curtain airbags as well as 15-inch alloy wheels and an MP3 compatible 6-stacker CD sound system. Quite unlike anything else on the road, Nissan’s Japanese-made Micra brings a distinctively fresh and different look to the city car ‘scape'. Central to the Micra’s ethos is its easy and fun to drive nature: crisp and nimble handling, fantastic manoeuvrability and impressive levels of comfort and quietness. These characteristics are drawn from the Micra’s platform, designed jointly with alliance partner Renault and which delivers a class-leading chassis in the most cost-effective way possible. The torquey 1.4-litre four-cylinder engine produces 72 kW at 5,600 rpm and a nifty 137 Nm at 3,200 rpm. The result is a welcome combination of punchy performance and remarkable economy from the 965 kg lightweight, a highly valued asset for all four-cylinder car drivers. The all-aluminium, 16-valve twin cam engine features Nissan’s Variable Valve Timing control system and ‘Drive-by-Wire’ electronic throttle. Extensive use of low friction moving parts and lightweight pistons improve both noise, vibration and harshness (NVH) levels and, also, fuel consumption. The standard advanced, electronically controlled four-speed automatic with extended slip lock-up control offers smoothness, economy and above all impressive responsiveness, in keeping with Micra’s fun to drive philosophy. The front suspension uses a sub-frame mounted strut with combined suspension upright/coil spring assemblies and a forward lower link. The front anti-roll bar is attached directly to the strut assembly for more effective control of body-roll under cornering. The sub-frame uses compliant rubber mounts to isolate road noise and vibration from the platform, improving both refinement and ride comfort. A rear beam suspension with trailing arm location and separate coil springs and damper units provides rear wheel control and proven ride comfort. 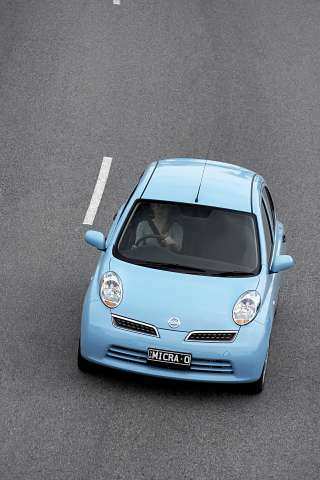 The Micra measures up, with an overall length of 3,725 mm, overall width of 1,660 mm and overall height of 1,530 mm. The wheelbase is 2,430 mm. "The Nissan Micra not only stands out from the crowd with its fresh, friendly and fashionable looks, but it can boast excellent driving characteristics and incredible packaging." "It’s the ideal solution for city drivers who want a neat compact car with all of the trimmings, but at a very competitive price," Mr Booth said. *All prices quoted are recommended retail pricing and do not include metallic paint, dealer delivery and on-road costs.